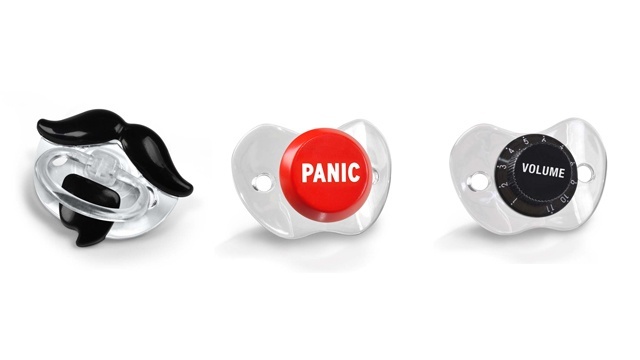 This has been a busy time for pacifiers. Last week we told you about Playtex Pacifier Clips being recalled due to a choking concern. This week…same concern, different product. At some point, America, we are going to have to learn how to make a pacifier possible. We put a man on the moon. We ought to be able to make a passie that does to put children at risk of death. 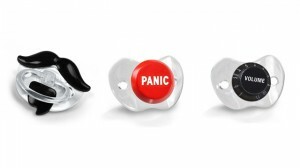 According to the Consumer Product Safety Commission (CPSC), approximately 183,000 Fred & Friends pacifiers are being recalled due to a choking hazard. The beard on the Chill Baby Artiste, the knob Chill Baby Volume, and the button on the Chill Baby Panic pacifiers can detach posing a choking hazard to young children. It has also been determined that the ventilation holes on the Volume and Panic pacifier guards are too small. This isn’t the first time that we have told you about the recall of a children’s product from Fred & Friends for choking concerns. In July of last year, Fred & Friends had to recall 57,000 baby rattles, the “Buff Baby” rattle over a concern that the rattle’s end cap can separate, releasing small parts. Now, I’m no genius, but if the beard can detach from the pacifier, isn’t it possible for the mustache to detach? Yet, it is listed as a “must have” product on this company’s website, and even goes so far as to offer a page of cute snap shots. While they do look adorable, in an abundance of caution, don’t you just have to take a second look at selling this product? I mean, do you really want to risk it? Really? Is it that cute? The answer is of course not. But that is not really what we are dealing with here, is it? Companies are desperate to niche their way into a market and they have to throw in these silly add-ons. What parents often don’t know is the real choice they are making is between safe and cute.